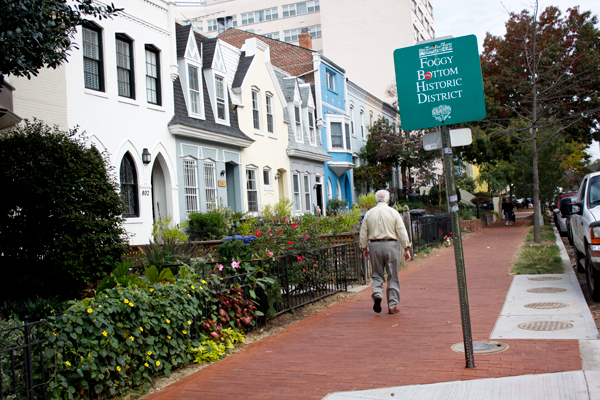 GW professors are using their expertise to help make DC into a more aging-friendly city. Fifteen professors will lend their expertise to a city-wide group that’s pushing to make D.C. a better home for elderly residents. The faculty, mostly in the fields of exercise science, health care, nutrition and public policy, will work with students to map out ways for D.C. to meet the “age-friendly” standards set by the World Health Organization. It’s the first step in the District’s overarching plan to have the World Health Organization designate D.C. as an “age-friendly” city by 2017, as part of a task force co-chaired by University President Steven Knapp. Robert Burke, a health care administration professor in the School of Public Health and Health Services, said GW’s research will identify and ultimately help the city meet its goals, such as improving transportation, affordable housing and social inclusion. About one in four elderly D.C. residents live in poverty, the highest poverty rate for seniors in the nation, according to a Kaiser Family Foundation study. “GW sits in Foggy Bottom, an area where the majority of people are older Americans. Getting them to participate more in what’s happening at GW is the focus,” he said. Knapp was sworn in Oct. 17 to co-lead the 23-person task force with Beatriz Otero, the deputy mayor for health and human services. The group will present a strategic plan for D.C. in June. Gail Kohn, an alumna, is coordinating the program. Knapp has highlighted GW’s Institute of Spiritual Health and the Center on Aging, Health, and Humanities as examples of the University’s longstanding commitment to end-of-life issues. “We hope the initiative will not only engage GW but the broader D.C. community as well,” University spokeswoman Candace Smith said Sunday. She said the task force would swing into gear in the spring. The World Health Organization launched an age-friendly initiative in 2006, aiming to create “living environments which promote the well-being and contributions of their older inhabitants.” Experts assess the “age friendliness” of a city by its outdoor spaces and buildings, transportation, housing, social participation and other factors. The Global Network of Age-friendly Cities and Communities, which D.C. joined last year, includes 138 members across 21 countries. Each participant must commit to a four-stage process, which includes analyzing the city’s needs, planning, implementation and progress evaluation.